Guta Lag, the law of the independent island of Gotland, is one of the earliest laws of Scandinavia. The historical appendix to the law, Guta Saga, was written in the thirteenth or fourteenth century. Together, Guta Lag and its accompanying Saga provide an invaluable insight into the lives of the people living on Gotland, the largest of Sweden’s Baltic islands, in 1000-1400. 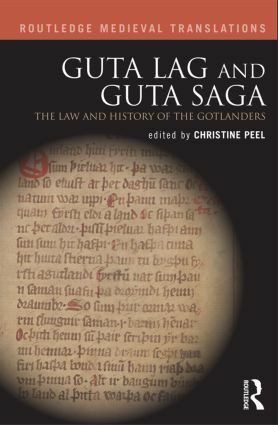 Guta Lag and Guta Saga: The Law and History of the Gotlanders is the first time that these two important texts have been translated into English and combined in one edition, accompanied by an extensive commentary and historical contextualisation by Christine Peel. In the Viking Age, the island of Gotland maintained its own law and administrative system. It was distinctive among Swedish provinces, retaining its own laws until 1645 while mainland provincial laws were all superseded by national law in the mid-fourteenth century. Preserved in eight manuscripts, it illustrates the everyday life and administrative system of the people of Gotland. Guta Saga tells the story of the island from its discovery by the legendary Þieluar, who removed the enchantment upon it which led to its inhabitation. Read together, the texts provide a complete picture of an island unique among Scandinavian provinces, offering a rare view of everyday people in medieval Scandinavia. This innovative and timely translation will be fascinating and essential reading for scholars of Scandinavian studies and legal history. "This superb edition is a major contribution to the study of legal culture in North-Western Europe. It provides a critical and scholarly view of the workings of one of the most culturally distinctive societies of the Central Middle Ages and it will serve as a key work of reference for many years to come. The insights found within this volume have resonances beyond the field of medieval studies and across the social science disciplines." "Translation of laws from the Middle Ages allows us to travel in time. The Guta saga and Guta Law are primary sources for Scandinavian legal history. These ancient texts are also tremendously important for all research on medieval Gotland and the Baltic Area in general. Their valuable and entertaining contents are interesting to both the specialist and the beginner." Christine Peel gained her PhD in Scandinavian Studies from University College London and is an expert on provincial laws in Sweden.